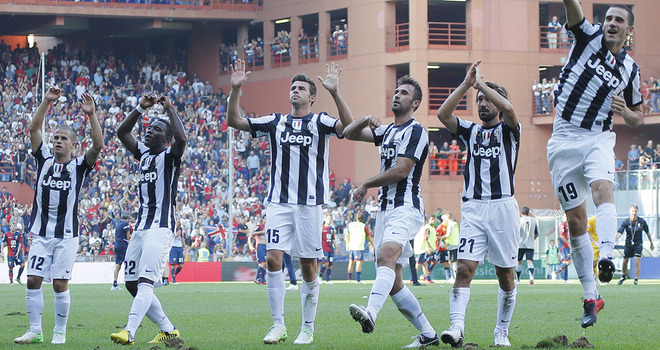 The Italian champions aren’t the only team to begin the season in Italy with 3 wins. Napoli, Lazio, Sampdoria. But after beating Genoa 3-1, Juventus have now gone 42 matches without losing, a streak stretching back to the 2010-2011 season. All this without Antonio Conte, which might indicate how important (or not) it is to have him standing on the sidelines each match. In fact, Juventus have been perfect this season, beating Napoli 4-2 in the Italian Super Coppa to kick off the season. Next was the comfortable 2-0 win over Parma at home, with Andrea Pirlo scoring a very controversial (probably didn’t make it across the line) goal to seal the victory after Stephan Lichtsteiner put them ahead earlier. The Udinese match was another case of why people will always cry conspiracy when it comes to Juventus. Udinese’s keeper, Zeljko Brkic, got sent off in the 12 minute for a foul that didn’t happen, and after Arturo Vidal made it 1-0 in the 14th minute, it was all over. Mirko Vucinic, Juve’s best player so far this season, scored the second goal while Sebastian Giovinco got to score his first goals on his Juve return. After the international break, Juventus didn’t start playing better. They were terrible against Genoa for most of the match, going behind 1-0 in the 18th minute after Ciro Immobile scored. When Andrea Pirlo is bad, the entire team looks bad, until both Kwadwo Asamoah and Mirko Vucinic stepped on the pitch. If Asamoah brings in a lot of energy and aggression that the midfield was missing, Vucinic simply becomes a second playmaker, just higher up. Giaccherini scored the equalizer after 61 minutes, and Asamoah won Juventus a penalty (so-so) that Mirko Vucinic converted. Asamoah himself scored his first goal for the club in the 84th minute to seal the win. Help from the referees? A little. Playing great? Nope, not yet. Juventus didn’t really settle for winning the league title last season. This is a club that expects to be among the best in Europe, and creating dominance, consecutive dominance in the league seems to be a must. They were the only club to actually dig deep and spend a lot of money during the summer in strengthening the club, looking for a successful season in both the Serie A and the Champions League. There’s a bit of over reliance on Pirlo, who won’t be playing forever. Maybe the summer with the national team took its toll on the midfielder, looking a bit tired and slow in his build up against Genoa. Juventus have other players who can shoulder the load, but not completely, not yet. Even with Pirlo far from his best early on in the season, nothing but a league title will be acceptable in the current Serie A climate.